Historical Background of the Book. In Old Testament times, the economy of Canaan was based predominately on agriculture. 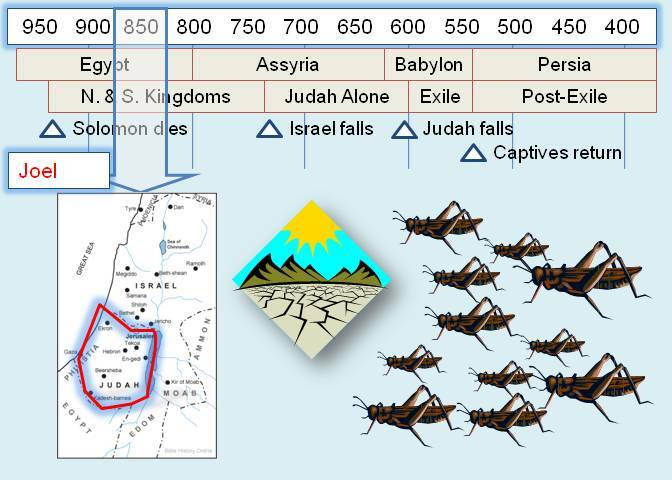 As an agrarian economy, the Northern and Southern Israelite kingdoms could suffer hardship from any number of sources, including droughts, insect infestations, and livestock diseases. The date of the book of Joel is uncertain. Some scholars (as reflected in this survey) believe it may have been written as early as 830 B.C. During this time, the Southern Kingdom was experiencing both a prolonged drought and a plague of locusts. As a result, there was considerable suffering of both the people and their livestock. The Author and the Audience. Joel was the son of Pethuel (Joel 1:1). The Bible reveals nothing else about him. His audience was the Southern Kingdom of Judah. He uses their present physical suffering as a warning of their unfaithfulness and calls them to repent with warnings of even more destruction to come. Scholars are divided over the prophetic fulfillment of this book. Some view the book as primarily physical, with eventual deliverance from the plague of the locusts. However, other scholars see a foreshadowing of the Babylonian invasion about 250 years in the future (around 600 B.C.) with the subsequent restoration of the Southern Kingdom. Still other scholars see the destruction of Jerusalem by the Romans in 70 A.D. preceded by the establishment of the Messiah's spiritual kingdom (the church) on Pentecost around 30 A.D. (Acts 2:16-21). Physical hardships should remind us of God and encourage us to draw closer to Him (Matt. 6:25-34; Phil. 4:4-7). God always provides blessings for those who remain faithful to Him (1 Pet. 5:6-10; Rev. 2:10). The last and ultimate "Day of the Lord", the Judgment Day, still remains to occur and we should always be prepared for it (Matt. 24:42-44; 25:1-13).